Home > SHOP ALL PRODUCTS > d-Lenolate Topical Skin Treatment 4 OZ. This topical formula provides natural solutions to fight vitally every chronic skin problem. d-Lenolate® Topical Skin Treatment Formula penetrates to the third layer of skin and in the presence of blood, transforms into nature's most powerful and broad spectrum pathogen exterminator. Skin Care with the Healing Power of the Olive Leaf. 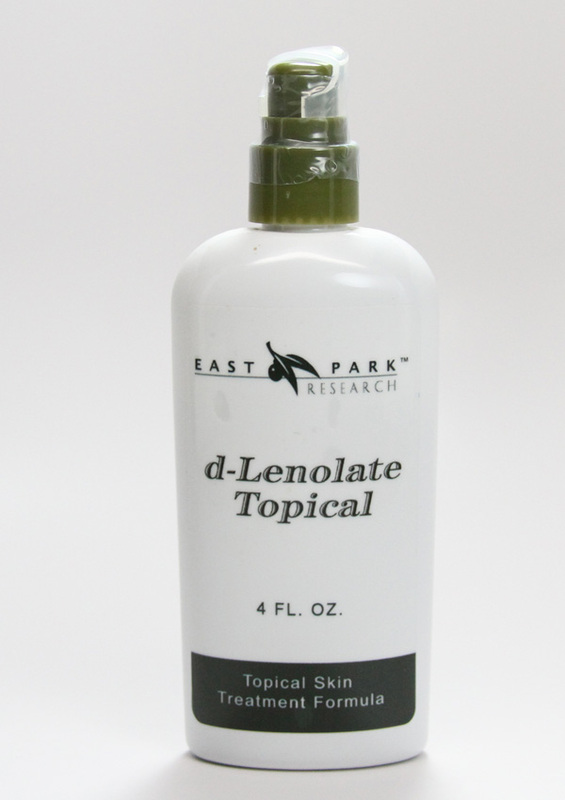 d-Lenolate Topical is a natural solution for skin irritation that helps stabilize and repair skin tissue. Using the healing power East Park's d-Lenolate, this topical formula provides natural solutions to fight vitally every chronic skin problem. d-Lenolate Topical Skin Treatment Formula penetrates to the third layer of skin and in the presence of blood, transforms into nature's most powerful and broad spectrum pathogen exterminator. Unless the pathogens that cause most skin problems are eliminated, any relief from those maladies will be temporary at best. Selected to synergistically combine for powerful protection against bacterial infection, the ingredients in this chemical-free topical solution can be used in direct contact with mucus membranes. Each application should be accompanied with at least one d-Lenolate capsule, with at least three (3) applications per day recommended. For those already taking d-Lenolate capsules, there is no need to take more when applying the Topical. Initially, when using the Cleansing Bar and Topical Formula, some customers due note an initial worsening of the condition they are using it against. Don't worry. This is a typical - and even desired - reaction, as it shows the area is being purged of toxins. This is similar to the Herxheimer Response some people may experience when taking the d-Lenolate capsules. The Topical formula is not recommended for ingestion. Topical may be used during pregnancy or while nursing, but we highly recommend speaking to your obstetrician before using any herbal ointments during this time. The hair and skin care products may be used at any time, but will be less effective if used in conjunction with an antibiotic cream or ointment.